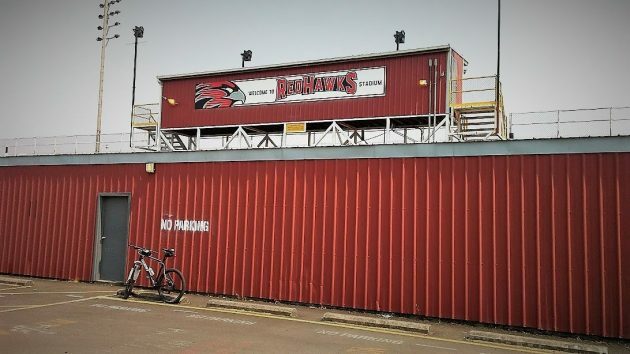 You’re looking at the back of the press box at RedHawks Stadium, the renamed athletic field of South Albany High School. In terms of outdoor signage, the high school’s rebranding is almost complete. I’ve been going past the football field from time to time on the bike, hoping to catch them replacing the big “Rebels” lettering. Missed it, though. The new name was up when I got by there on Wednesday afternoon. Wondering what the name change is costing? School district Business Director Russ Allen gave me an update earlier this month. There had been cash donations of $7,000 from Tonja Everest, the former assistant superintendent of Greater Albany Public Schools, and $1,250 from Hewlett Packard. In addition, Allen said, the turf company is working at cost to update the lettering on the field, and a company has made an anonymous donation with a value to the district of about $30,000. 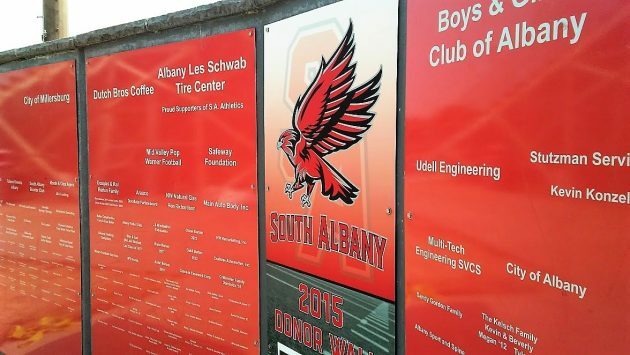 South’s new RedHawks mascot spreads its wings on the donor wall near the football field. Tsk, tsk…a glaring “parking” violation in the 1st pic! So the beat to rename to be Democratically P.C. goes on. So far, getting rid of our history has been a lot cheaper than Mao’s cultural revolution.